BT Cocktail / Gee Whiskers! I wrote a post back in May about attending the BT Cocktail launch event in Cape Town. At that event I received the full version of the product to test out. 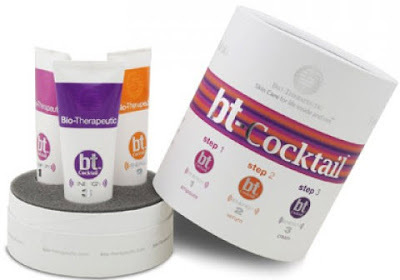 The set is a full 45 day treatment which meant that it has taken a while for me to write a review on it. This post is a review post so I am not going to go into the full scientific details in this post. I covered the details of the product in my previous post, so please visit my post to read more. First off, I myself only used the system for one week. Now before you gasp at me, the reason why I only used this for a week is because within that week of use I already started to see improvements. I thought it might just be my imagination. So I passed the set on to my Mom to use so that I could be more objective and see results without relying on my mirror. My Mom has been using the cocktail for 3 weeks and still has more than enough to see her into week 4 and 5. What my Mom and I both noticed was that within the first week we could already start to feel a difference in our skin. In fact from the very first treatment there was a noticeable change in the feeling of our skin. I woke up the next morning with beautifully dewy looking skin and it stayed that way all day. Over the course of the week my skin retained that dewy glow and the texture of my skin started to improve. I was truly amazed at how quickly one could feel and see the difference. It was at this point that I thought I wasn't being objective enough and passed the set on to my Mom to use. My Mom obviously has more mature skin than what I do, so I thought this would be a wonderful test to see how things go. Between the first and second week the biggest thing we both noticed was the improvement in the appearance of her skin. Her skin looked healthier and had a natural glow. My Mom battles with dry skin and when it becomes very dry it appears to look dull. The BT Cocktail really helped to give her a more youthful and healthy glow. By the third week the overall tone and texture of my Mom's skin also saw a noticeable improvement. Some of her fine lines went away and her more deeper wrinkles were slightly less noticeable. Overall I was and still am, very impressed with this product. It definitely does deliver on its claims. At first glance this set does seem rather pricey at R1596, however one has to keep in mind that there are 3 different products in the set an Ampoule; Serum and Moisturiser. The Energy 1 is a rather runny fluid that absorbs very quickly into the skin. The Energy 2 is a thicker consistency serum that has a very slight fragrance. It also is fully absorbed into your skin a few seconds after application. Lastly, Energy 3 is a moisturiser that completes the 3 step kit. It has a mild fragrance, is rich and is quickly absorbed. All 3 products spread easily over your skin and that is why the kit lasts so well. At most you need a pea sized amount of each product to cover your face and neck area. After applying all three products your skin feels wonderfully moisturises and hydrated but no excess product sits on the surface if your skin. My skin was always dry to the touch and felt beautifully smooth after each use. Would I buy it? I honestly don't know. The results are truly amazing and I have seen them for myself. When it comes to my skincare routine I am just too loyal to the products I use and that are currently working for me. Plus shelling out R1600 every second month is a little too steep for my pocket. Would I recommend this to people? Most definitely! I think my Mom is definitely seriously consider switching to this system permanently. If you have any questions please leave a comment and as always, I will respond to each one. It sounds amazing but I agree, R 1600 every 2 months is a bit much for me to spend as well. My skin is very pale all the time and only goes a little darker in summer - but that is because I am mostly like a vampire, I stay out of the sun to avoid getting freckles on my face. Even when I wear sunblock I get them. I also have pale skin and tend stay out of the sun because 1. I don't want to look like a granny by the time I'm 40 and 2. because I burn easily. Can't wait for Summer - was telling Chicara yesterday I'm going to try a bit of fake-tanning this Summer. Hope I don't look like an Oompa Loompa though lol! Wow this really sounds amazing!! Pity about the big price tag. This stuff really has been remarkable! The price tag will scare people off, but those who can easily afford it should definitely consider it!